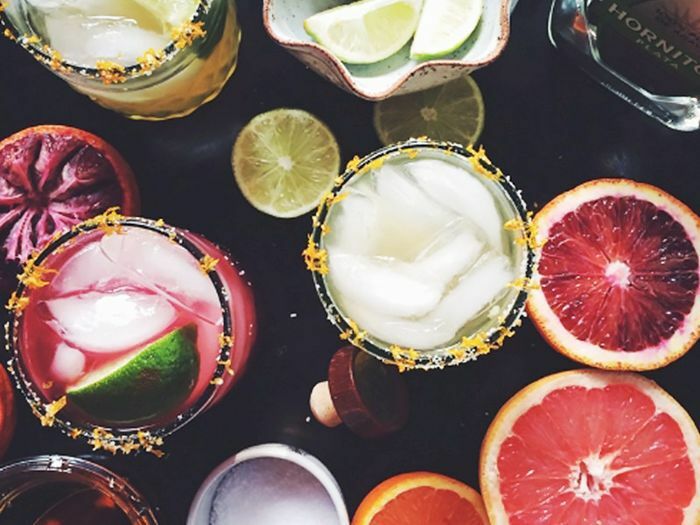 Oh, happy hour: the sacred social ritual that helps any day end on a high note. We know that sometimes there’s nothing better—or more necessary—than some libation-fuelled fun. If you’re like us, though, you might have a hard time reconciling your happy-hour habits with your healthy-living intentions. Are the two mutually exclusive? Turns out, they’re not. With the help of registered dietitian Farah Fahad, we gathered some expert tips on navigating the bar menu with health and wellness in mind. Ready to imbibe mindfully? We’ve rounded up Fahad’s top tips just in time for happy hour. Our biggest takeaway from our time with Fahad was simple: Added sugar is public enemy number one when it comes to cocktails. “The thing you need to look at before anything is which drinks have added sugar in them. Those are a big no-no,” she advises. Wondering why? As Fahad explains, alcohol converts to sugar as it metabolises, so when you add a sugary mixer—like sweetened cranberry juice or margarita mix—into the equation, it becomes too much for the body to handle. And it gets worse: “You’re going to become extra dehydrated and your hangover’s going to be worse,” Fahad cautions. So say farewell to those margaritas, mojitos and sugar-rimmed lemon-drop martinis (sniffle), but don’t fret completely, because there are healthier—yet still delicious—options. Fahad’s picks for the three healthiest alcoholic drinks are—drumroll please—red wine, champagne and vodka. OK, things are looking up. “Notice all of these are not mixed drinks,” Fahad says. “They don’t have additives; they’re just alcohol on its own. These are what I call clean drinks.” What about other liquors—like whiskey or tequila—served without sugary mixers? “That’s fine also. Those would be my numbers four and five on the list,” Fahad tells us. When it comes to soda, soda water is a great clean option, but regular soda is out the door. “Coke is on my list of never—not on its own, not with alcohol. There are absolutely no benefits from Coke, and now they’re finding it disposes calcium in your bones. On top of the high sugar content and high sodium content, there’s a myriad of problems with Coke,” Fahad explains. If you’re more of a red-wine drinker, rejoice! You’ve likely heard it before, but Fahad agrees that red wine can benefit your health: “Research has shown there is resveratrol in it, which makes it good for your heart and good for reducing inflammation. It also helps take pressure off the pancreas.” But before grabbing yourself a bottle, keep in mind benefits are witnessed in moderation. “I would say two glasses,” notes Fahad. White wine, on the other hand, doesn’t pack the same nutritional punch. “It doesn’t have as many beneficial components as red wine and tends to be more acidic on the body. For overall wellness, I would say red over white,” Fahad recommends. Finally, remember that an excess number of any type of drink can take a toll on your wellness. Exactly how much is too much? “Two is my magic number with alcohol,” Fahad says. In addition to staying hydrated, Fahad suggests fuelling up before you hit the bar. “Don’t drink on an empty stomach,” she says. “Food will help absorb the alcohol. Try to eat something with lean protein or healthy fats, like olive oil or avocado. You don’t want to be carbing and drinking, and then after you drink, you start carbing again. That’s when I find you start to gain weight.” Who’s ever done such a thing? (All of us.) “So eat a healthy dinner, have a couple of clean drinks, and you won’t suffer the ramifications the next day like you would if you were carbing and having sugary drinks,” Fahad tells us.